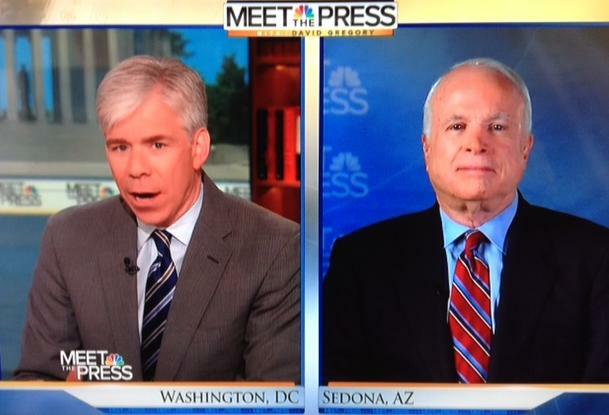 Today’s Meet the Press began with discussion of the so-called “red line” in Syria with Senator John McCain (R-AZ). McCain believes the red line (use of chemical weapons) has been crossed, but he said it should never have been created. He said that it gives Syrian President Bashir al-Asad an implicit green light to do everything short of the red line. Later in the broadcast, NBC’s Chuck Todd said there is regret in the White House about ever using the “red line” phrase. Senator McCain called for creating a no-fly zone in Syria and supplying resistance fighters with weapons. He also said we should be prepared with an international force to go in and secure potential chemical and biological weapons in Syria. However, he cautioned against US boots on the ground. On terrorism threats in the United States, Rep. King said that we should pay more attention to the “Muslim community.” The use of the word community raised concerns for Rep. Ellison. Ellison said that we should “by all means” go after potentially dangerous people, but not entire communities. Ellison said we went after a community in World War II with Japanese internment. Today’s broadcast also included a standalone interview, taped in Dallas at the dedication of the George W. Bush Presidential Library, with former British Prime Minister Tony Blair. Blair said today’s fight against radical Islam shares much in common with our 20th century fights against fascism and revolutionary communism.